Use the various links posted on this page to access the Metro Bank job application online. The links on this page will direct you to the company’s main employment page/site. Numerous types of careers can be searched/applied for via the company’s online careers site. 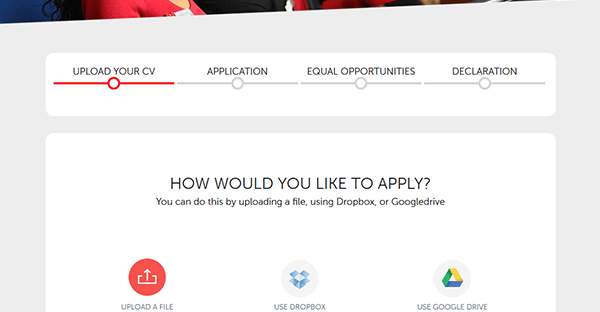 Learn more about the online application/hiring processes by following the steps in the guide posted below. The company’s careers webpage allows you to search for current job openings, learn more about the types of positions that are available, as well as apply for numerous careers. About the Company: Metro Bank is a U.K.-based bank that is headquartered out of London. The company was formed in 2010 and has over 50 locations. Metro Bank employs more than 2,000 people. 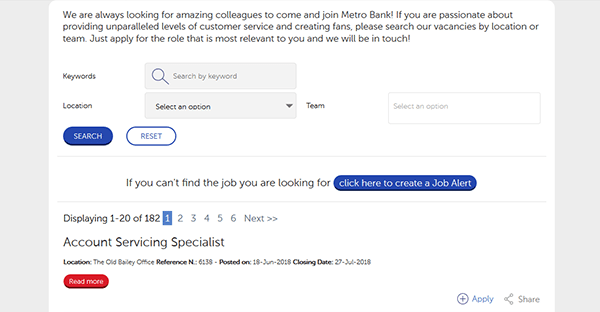 Step 1 – The Metro Bank job application is available online via the company’s employment/careers page. Click here to open the site in a new tab or window within your current browser. Step 2 – Scroll down the page and click the “See our current vacancies” button/link. Step 3 – Scroll down and then fill out the search form. Hit the “Search” button to load the list of current openings. 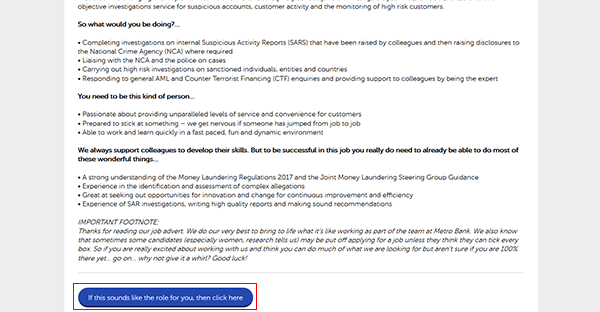 Step 4 – Click the “Read More” button under the specific role that you’re interested in applying for. Step 5 – Review the job description and then click the button that’s outlined in the below screenshot to go to the next step of the process.